The answer to the chicken or the egg dilemma when it comes to what should happen first, building electric cars or setting up the recharging electric infrastructure is obviously to have both at the same time. Enabling A Smart Charging Station Network. Obviously, if we want our electric cars to be driven, we need electric charging stations and the ones that will recharge them in a jiffy. The other more interesting dilemma is which type of charging stations, home and public wired-based or wireless. The Department of Energy, DOE is finally weighing in on how our electric transportation infrastructure should look like by going ahead and funding the wireless charging stations system should look like. Wireless it is and with $4 million it hopes to make induction charging for electric vehicles a reality. The DOE believes the fruit of its labor will happen within the next 10 years where we will see the technology bloom and make its way in force on our streets and garages. DOE’s Vehicle Technologies Program. The DOE’s Vehicle Technology Program so far is 84% done and has already granted $400,000. It aims to install wireless charging stations throughout the country’s roads, which will be powered by solar energy and would hold a constant charge for electric vehicles to continue their travel. The DOE will work as closely as possible with the auto industry in order to further the progress wireless charging station technology. 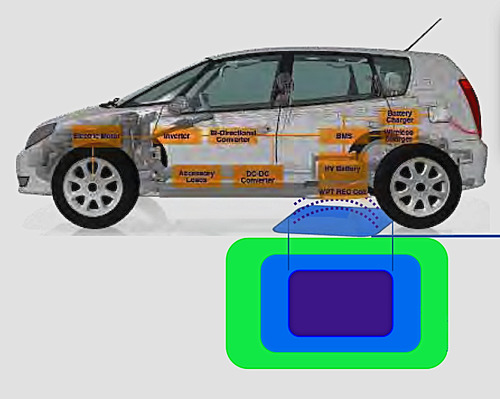 It will select up to four projects to work with to research and develop a viable wireless charging system. Once agreed upon, the induction system will be fitted onto production electric vehicles, then tested in real-world conditions. Wireless Charging Technology Benefits. The benefits of recharging an electric car wirelessly, or via induction are many. For one thing, the technology greatly extends the rage of a car. While stopping to eat or rest, an almost full charge can be achieved in as little as 20 minutes or so. Another added benefit is that now electric carmakers don’t have to squeeze in as many batteries as possible. The performance of an electric car is dramatically reduced after you reach a critical weight point of adding too many batteries. Simply put, after slapping on too many batteries, the EV becomes too heavy to be used efficiently. Wireless charging stations would allow smaller battery pack cars to be driven all day and recharged wherever they are parked. This ideal scenario would be to have them installed in cities where cars could recharge as they park. This scenario could also work for highway driving, albeit with longer rest periods. It might sound strange to say but hands-free, automated charging of a parked electric vehicle is a major plus for many would be EV owner. The idea of handling 440V of electricity, especially in rainy parts of the country is understandably not everyone’s cup of tea. Wireless, inductive charging would do away the necessity to go out and plug in an EV to a high powered station. According to the latest rounds of funding, charging station companies have been very active, to say the least. A six-state network project consisting of 15,000 charger installation led by Ecotality, was granted $100 million federal funds and another $15 million fund was granted to Coulomb Technologies’ Charge Point America project. This last project also uses private investments to install 5,000 public plug-in points across nine states. What About Renters? There is still a contention point that has so far not been answered, that of what to do about renters who don’t necessarily have a garage space and private charging stations. What do you do with the potential clients who would like to own and operate an electric car but park on the street? While solutions are plentiful, real practical ones are still not out there yet. The next step will be to provide multi-unit charging stations per street blocks or simply induction wireless parking spots, something this DOE project aims to start. All in all, the chicken or the egg debate is no longer taking center stage as electric cars are hitting the road, companies such as Aerovironment, Ecototality and Coulomb Technologies continue to fill in the much needed charging infrastructure while inductive wireless charging stations are taking shape.